The Parish Council has been asked to reconsider relinquishing the larger of the two greens behind Woodlands Close, this is a poll to gauge your views. Please vote for one option only – so if you think option 2 is the right one tick that one, or whichever you prefer. Whilst indistinct it spells out a name; Ian, Jan or Pam. If you know of anyone who might have made this ‘inscription’ please get in touch. The residents and contributors recently donated almost £4,500 to get the War Memorial refurbished. Not only is it an offence it is insulting to the memory of the soldiers who are commemorated there. Sadly, our Parish Clerk, recently announced her wish to tender her resignation and we are seeking a replacement. 07860 917446 or e-mail utkintonpc@gmail.com . An oil painting by Salvador Dali. The name of the Church where we come to worship is Saint John of The Holy Cross. John drew a sketch of Jesus on the cross. This depicted the pain, suffering and agony of Jesus during his Crucifixion. This Sketch was shown to Salvador Dali in 1945 and from it he painted ‘John of the Cross’. It took him four months . 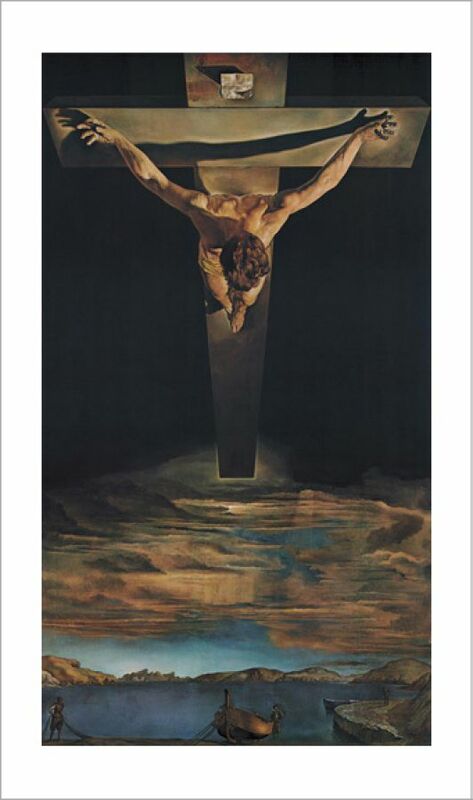 Dali took the centre of his painting as the bowed head of Jesus and drew a triangle around it from the outstretched arms to the feet. This to represent The Holy Trinity and Life Everlasting. The Dawn of a new beginning. It is a view of a tormented God The Father looking down on his Son from above against a darkened sky. Floating over a tranquil body of water on which there is a fishing boat and fishermen: ‘The Fishers of men’. The land behind represents the lands where Christianity spread. It was purchased by The Kelvingrove Art Gallery, Glasgow. They were much criticised for purchasing a painting from a non-Scottish Artist. Many also had a view that it was too Catholic. Nevertheless, it was seen as a wonderful painting of great impact and all who see it cannot help being affected and greatly moved. The Spanish Government offered to purchase it from the Gallery for $80 million. This was not accepted. It has been on loan to The Royal Academy, London and Exhibited at The Dali Museum, St Petersburg. It returned to Kelvingrove Art Gallery in 2018 and has become Scotland most treasured painting and has become the most profound Religious work in the world of the modern age. Dali was invited many times to visit Glasgow to see his painting, but sadly he never managed to make the journey. Our Church, in Cotebrook, now has a wonderful print of the painting donated by a kind and charitable parishioner and it hangs in ‘pride of place’ in the Church on Stable Lane, Cotebrook. It can be viewed when there is a service on a Sunday from Sunday 7th May. We know that we all have our own Parishes to think about, but Tarporley is our Key Service Centre and the roof is beginning to show signs of the dreaded ‘wear and tear’. A list of the ‘runners and riders’ for the 07:00 at Utkinton on 2nd May (there is a similar course at Cotebrook, but you will have a card to tell you where to vote). Going may be ‘heavy’ but sunshine is forecast. Please feel free to share these lists. You may vote for between one (1) and nine (9) candidates – vote for more than nine (9) and the ballot paper will be considered as spoiled and discarded from the count. We have been advised that the A49 will be closed at night in the Spurstow, Beeston, Brassey Green area. The road will be closed on 13th April for a maximum of five days but is expected to be closed for three. This is to allow Network Rail to carry out repair work. Please see the attached for more details including the diversion.